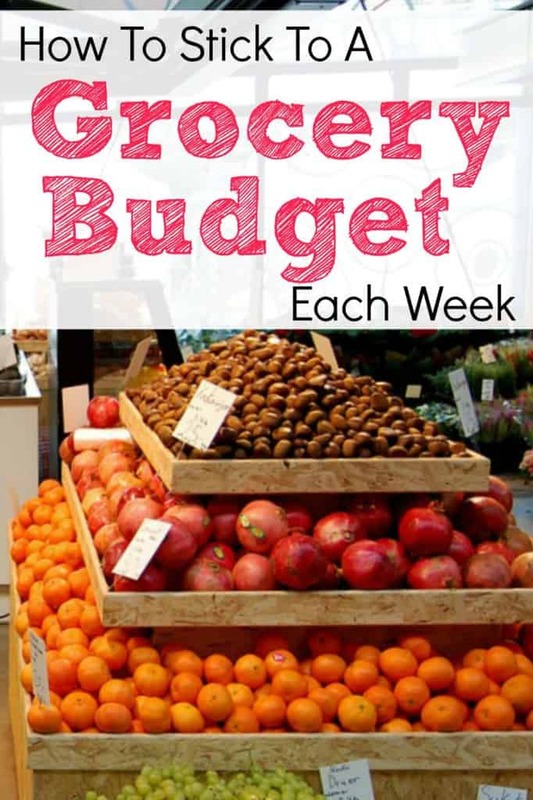 Do you stick to a grocery budget each week? I definitely do! Each week I budget $50 to spend at the grocery store. I decided it would be fun to take a photo of what I buy and list how much each item costs. I love reading how much other people spend money in their daily life. This includes creating a detailed and organized grocery lists to help you stick to your budget. In the past, I have written about how my tips and tricks to stick to a grocery budget. No matter what, I still have to plan my grocery list each week to make sure I save money. It's not easy to stick to a $50 budget for myself. I use every dollar and try to get the best deal possible while still buying the best food possible. The cost of groceries varies so much across the United States. I have to really plan out my meals ahead of time and figure out how to overlap my food. I pretty much each the same thing all week! Before I went grocery shopping, I wrote down what I had leftover to work with. You can do the same thing when making your grocery list. I purchased a waffle mix a couple weeks ago and made exactly one waffle. This was such a waste of money for me. Does this happen to anyone else?! Since I don't stock my pantry with bulk items, I told myself I have to incorporate this mix into a couple meals this week. Otherwise it will literally sit in my cupboard forever and I'll end up just throwing it out. If you're short on time or have no idea where to start when it comes to planning your meals, I'd highly recommend trying out the $5 Meal Plan. It's a $5 monthly subscription plan that sends healthy, affordable meal plands and shopping lists to your inbox weekly. I love how the $5 Meal Plan has gluten-free and picky eater friendly options for those who love switching up their meals. You can try it for 14 days for free here! Here is an example of my most recent grocery budget. I would love to know if your grocery prices are similar! *These are gremlin purchases and are not part of my regular budget. I decided to incorporate them into my $50 budget, but am ok if I end up spending a few extra dollars on additional food this week. **I bought an extra steak for my roommate. We went grocery shopping together and he bought corn tortillas and chips that we will share. I have about $6 leftover to use still for the week. I will probably end up grabbing a couple Greek yogurts, salad mix and some chocolate. 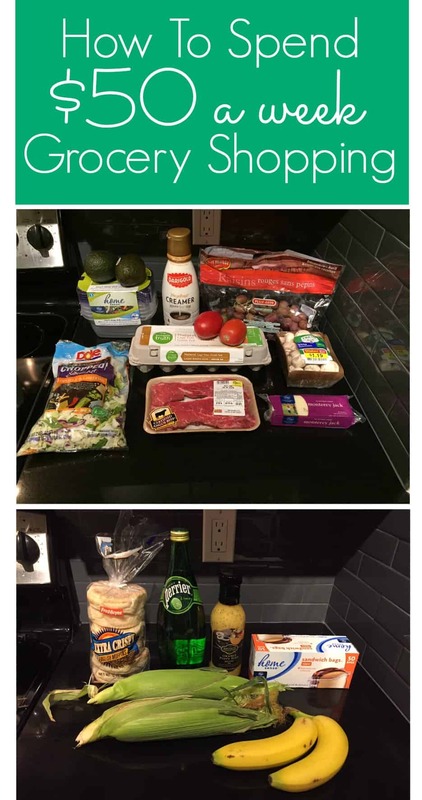 Here's what I'm eating this week. Not overly exciting, but good enough! As you can see, I'm going to be cooking all my meals this week which is what I usually do for the most part. Preparing your own meals will save you tons of money because it's cheaper to be whole and fresh foods as ingredients instead of buying pre-packaged, ready made food. Packaged food is often processed which means it has a ton of salt and preservatives in it. You don't have to be a chef to prepare your meals either. I like to keep it simple and stick to what I love. You can also look up recipes online or on YouTube for ideas or borrow a cook book from the library. It takes my less than 20-minutes to prepare most of my meals and sometimes I cook in batches so I'll have leftovers for the next day or to freeze. Batch cooking and freezing meals is a great way to save time as well as money since you can just grab a quick prepared meal out of the freezer instead of ordering takeout. I recommend getting some freezer-safe containers to store your leftovers. Freshware Meal Prep Containers [15 Pack] 3 Compartment with Lids, Food Containers, Lunch Box | BPA Free | Stackable | Bento Box, Microwave/Dishwasher/Freezer Safe, Portion Control, 21 day fix (32 oz) This set on Amazon is freezer, dishwasher, and microwave safe and comes with 15 containers. Should you coupon on a $50 grocery budget? I want to mention that I am not an extreme couponer! In fact, I rarely use coupons as most coupons I see are for processed foods and food I don't normally eat. I generally shop at two places – Trader Joes, located nationwide and occasionally Safeway, a grocery chain in the Pacific Northwest. As I have lived all over the country, I also shop at Publix and Krogers. Couponing can seem out-of-date or too time consuming to some, but if you're looking to stick to your budget, there are more modern ways to take advantage of discounts aside from cutting out coupons on newspapers. First off, you'll automatically save when you shop in season. I tend to buy whatever produce is in season to optimize the sales. As I mentioned above, I do not use a lot of coupons. I do make some effort to browse the grocery ads online ahead of time, as well as checking out what digital coupons my grocery store is currently promoting. You can do this by heading to the website of your favorite grocery store or checking out the Ibotta app which offers instant cash back rebates on a ton of groceries and personal items. I browse the sales each week for a few minutes before I make my list. Setting aside 10 minutes per week to do this is worth it to maintain your grocery budget. Get $10 cash when you sign up with the free Ibotta app! Couponing may still work for you which is great, but it's important to make sure you're receiving cost effective results for the time and effort you're putting in. Plus, you also want to avoid feeling pressured to buy multiple items just because they are on sale. If you are ready to stick to a grocery budget, you have to make a plan. Take some time to really think about what you need without being wasteful. If you know you are going to eat out a few meals, plan accordingly and buy less. There is nothing worse than wasting food! Have you been sticking to a grocery budget? Any suggestions on coffee budgeting and coffee shops spending . I spent way too much on coffeeay coffee shops but I like a cup in the morning and then another pick-me up i the afternoon. I am right there with you Stacy. I added coffee to my monthly budget. It’s not possible for me to nix it from my budget – I just don’t want to. Instead I give myself a monthly budget so I can plan for it and have no guilt. If I’m really trying to save money, I’ll skip the $6 latte and get a coffee but have them add a pump of syrup and steam the creamer so it feels like a latte, but it’s only half the price 🙂 Google Starbucks coffee hacks for lower priced options! Do you get your coffee at the same places? I use the Starbux app to get the points and free coffees, and then I use local shops that usually have a punch card for free coffee. Dunkin Donuts has an app too with rewards! This year were trying to stick to 50 a week all meals for my family of three. So far we’ve gone two weeks and been able to do a variety of meals. Taking cash and a list definitely helps so I don’t wander and pick up random not needed items! We live in California so things are expensive but having canned vegis and rice and pasta and spices on hand make a world of difference when all you need are the meats we try to have a protein vegis and starch every dinner and breakfast eggs and turkey bacon. I’m rambling but it feels so accomplishing vrs spending over 100 a week on snacks or coffee or fast food! For dinners only…. I recieve free breakfast, and skip lunch….